November 2013 - Pebbles, Inc.
Wishing each of you a very happy Thanksgiving. 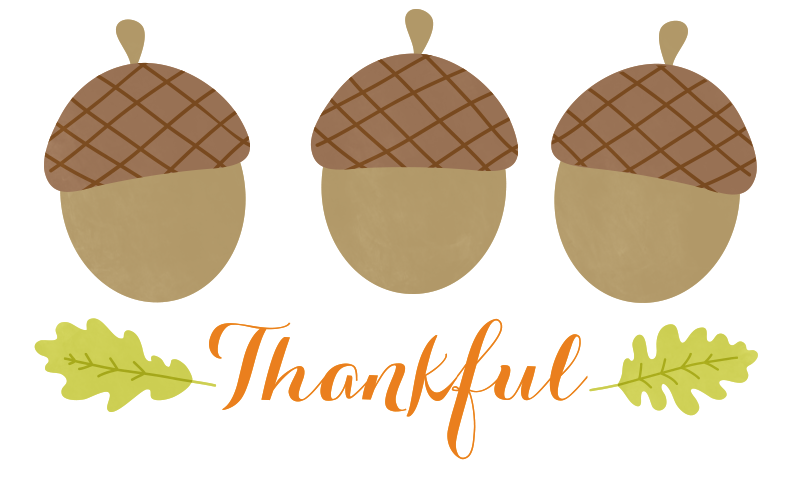 We are grateful for each and every one of you! 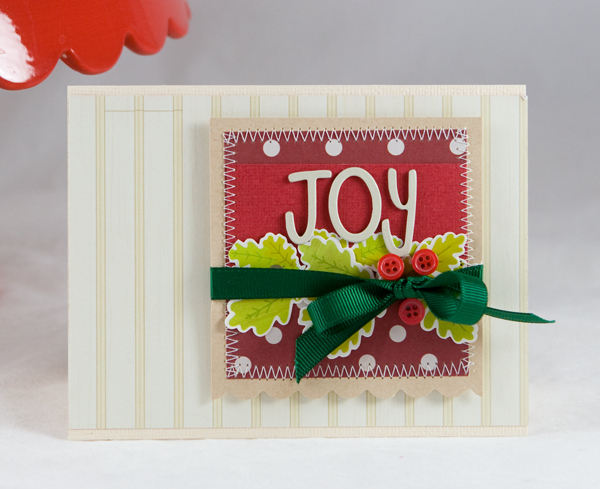 We wrapping up with our handmade Christmas card series with some awesome cards from Emily Spahn. I have friends who come from all different cultural and religious backgrounds. I wanted to create both cards that I could send to my friends that celebrate Christmas, as well as more “winter” themed cards that I could send to those friends that do not celebrate Christmas. I used the same basic design for both of my starburst cards, creating the burst effect by simply drawing it out by hand, cutting out each section, and then using each as a template to cut my various patterned papers. Because these cards used such a small amount of each patterned paper, I chose to use my From Me to You cardmaking pad, rather than cut up my large 12×12 sheets of paper. 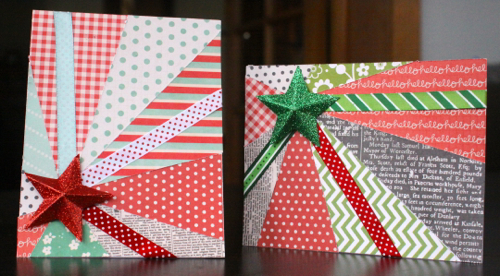 I love how easily the colors in the cardmaking pad work for both the Christmas and Winter color schemes. 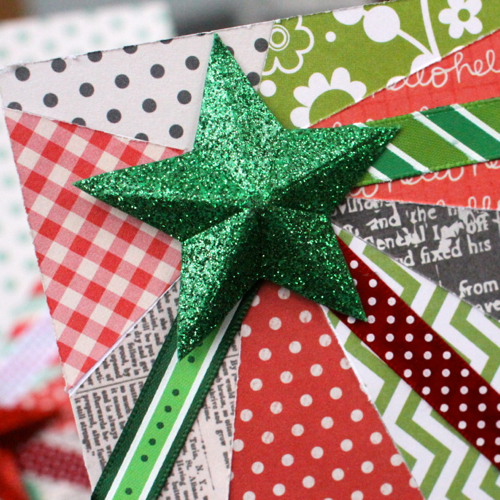 I simply added a single piece of Basics paper to the From Me to You papers to achieve the traditional Christmas color scheme of green and red. 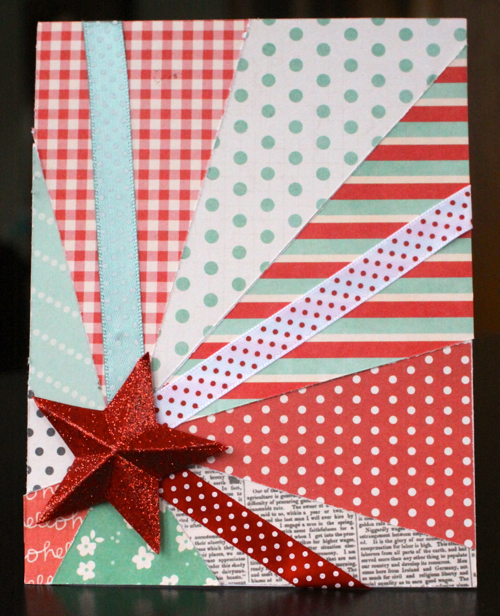 I also included some ribbon to give the cards a little more texture. The American Crafts dimensional stars were the perfect center to my starbursts! With the Thanksgiving break right around the corner, we’re starting to “wrap up” our handmade card posts so that we can move on to gift giving. 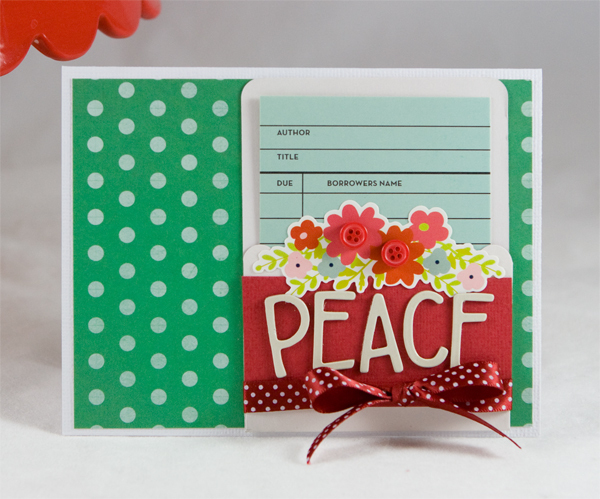 Today Design Team Member Holly Gagnon, from Ribbons & Glue, is sharing a couple of cards using our From Me to You and Front Porch everyday lines. I love the feel of rustic Christmas decor. You can find the cozy elements of pine cones, tree branches and birdhouses around my house during the Holidays. The Christmas cards I’m sharing today reflect this cozy, rustic feel of Christmas I love. 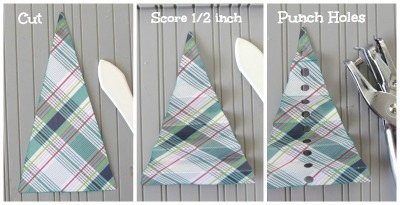 After you punch holes through your scored tree, feed a small tree branch through the holes and adhere tree on to the front of your card. This cozy Christmas card is made from a Christmas Card Kit cut file using From Me to You and Front Porch patterned paper along with POW glitter paper. 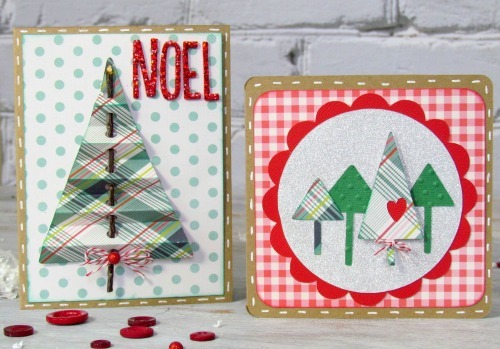 Have you been enjoying the handmade Christmas card series? 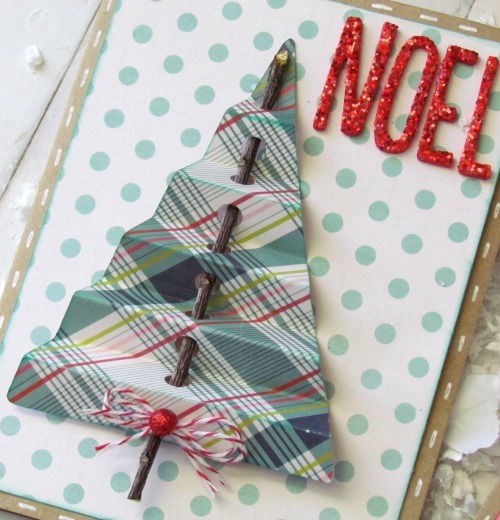 We’ve loved sharing how you can use everyday scrapbook paper to create truly traditional holiday cards. Today Design Team Marjan Pel is sharing a set of cards inspired by traditional Norwegian folk art. 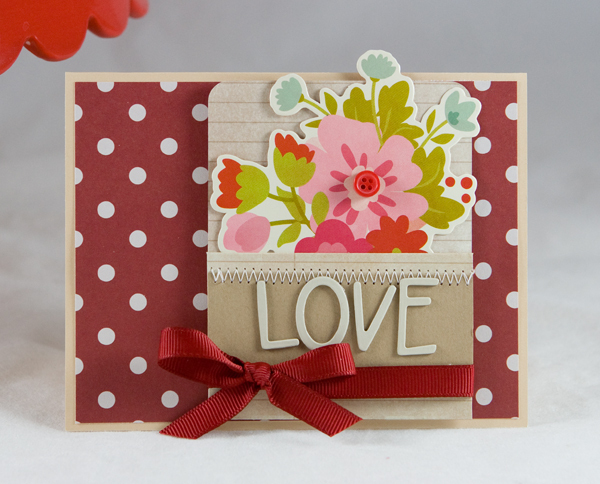 We think you’re going to love these beautiful cards that truly share the love of all things handmade. My Christmas cards are inspired by Norwegian folk art. I used some traditional colors like red, green, dark blue and white. I punched out hearts, snowflakes and triangles to create these stars that look like big snowflakes. I used my silhouette machine to cut out some additional snowflakes. I layered all small pieces of paper together. I embellished the stars with red glitter dots and an aqua crystal dot. 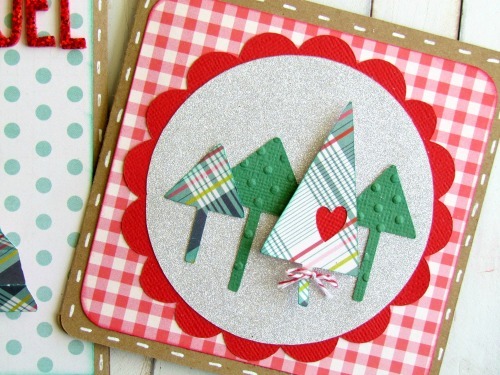 We love the simple beauty of these creative Norwegian inspired Christmas cards. 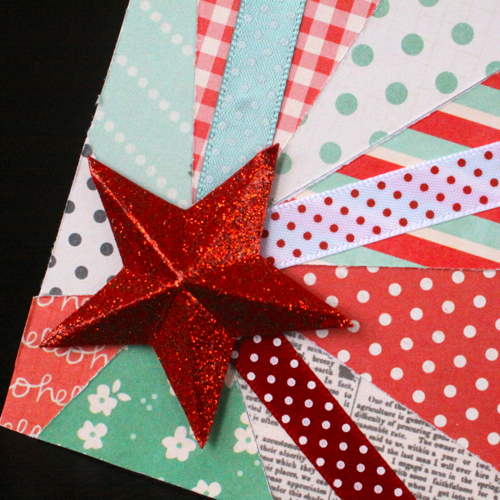 We’ve had so much fun sharing handmade holiday cards this week, we’re a little sad to see the week come to an end. 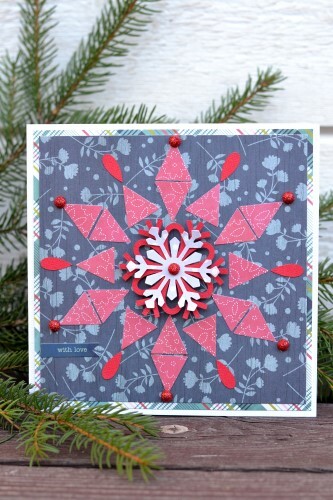 Today Design Team Member Kim Kesti is sharing three beautiful handmade Christmas cards. 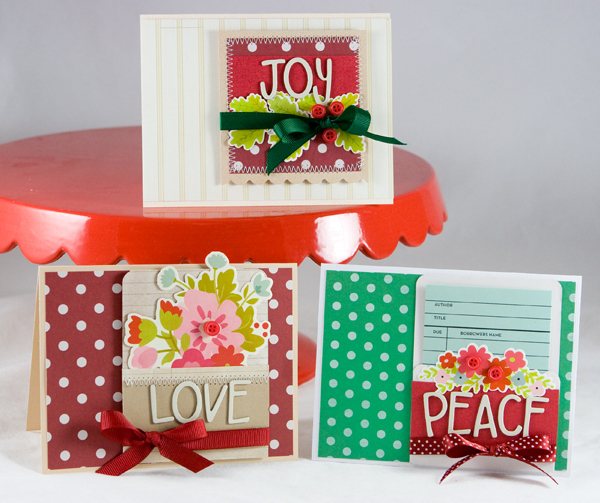 We love how the everyday elements give these cards a traditional feel. Every year I try to coordinate my holiday decorating, gift wrap and Christmas cards. Last year I used a lot of kraft, green and black. This year, I am going for a softer, more homespun look. 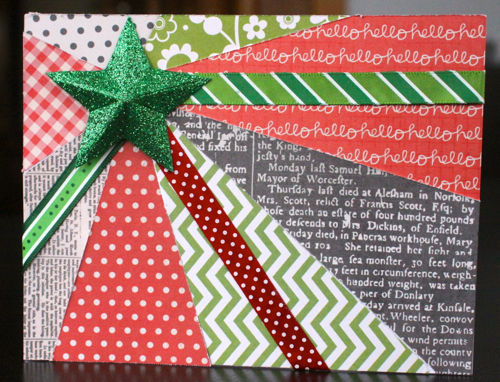 So, I was excited to create some holiday cards for the blog that use non-holiday paper. I think they still look quite festive, and the touches of cream, mint green and red are setting the tone for all my Christmas décor this year.